With a walkscore of 99/100 it can barely get any more convenient! Here’s your opportunity to keep your sights on the pulse of Ottawa. With a stunning Panoramic wall of windows you have great views up towards Parliament Hill as well as views over the famous Byward Market to the Gatineau’s. Click here to view the Photo Gallery or Click the Play button on the YouTube video below to get a preview. 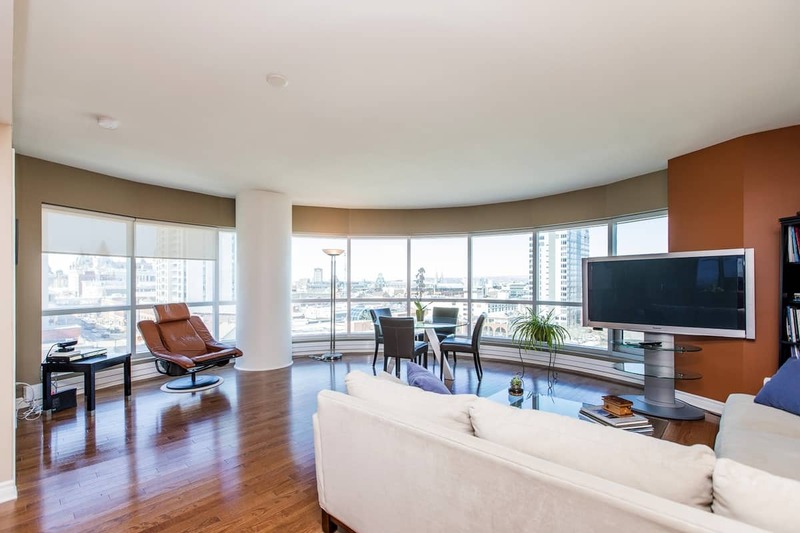 At 1238 square feet there are only a few floors of this layout with the exceptional view. The living area is totally spacious, open and flooded with natural light. The very spacious kitchen includes a bar counter from which your guests can watch you create or order in. Ordering in or stepping out to literally hundreds of food establishments within blocks is one of the many perks of this space. Two bedrooms, the master easily fits a king-size, has full walk-in, en-suite with soaker tub and shower as well as direct access to a balcony with similar views to the living space. The second bedroom has a convenient built-in Murphy Bed to be used as a guest room or office. There are only a few floors of this model with the exceptional view. All appliances, parking and locker is included as are superb amenities like indoor pool, sauna, lounge, two patios with bbqs, theatre and more. You’ve also got 24 hour security and concierge. Note: in addition to the amenities, your condo fee also includes your heat and air conditioning. Move in and step out to everything Ottawa has to offer! Click the attachments below to see more Property Details such as condo fees, taxes, room sizes and floorplan etc. Note the windows in the living area with no blinds have a UV protective coating installed. Check out the walkscore information below!